For these applications individual PTG2s are jammed (automatically preset and started) via an externally applied SMPTE time code signal. The generator's time value is set to the input time code time value and the time code user bits are set to the date plus a unique ID number for each individual PTG2. Each recording will then have the same time and date but a different ID number so the recordings cannot get mixed up later. 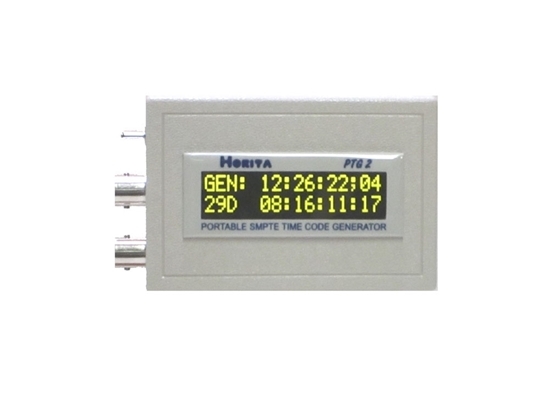 The PTG2 can also jam to the GPS time and date from an RS-232 serial data input from a GPS receiver for generation of precise worldwide UTC time of day and date time code. Provides selection of "LINE" or "MIC" output level when generating time code and includes various common MIC/ LINE adapter connectors. Time code generator "jam" mode presets the generator to TC or GPS serial data input values for time and date. Once jammed, generator operation continues and can be stopped only by powering the PTG off. This prevents accidentally stopping the generator via unintended actuation of the "run/ stop" switch. Low "free run" drift rate of less than one frame per hour over temperature. Able to "genlock" to an externally applied SD NTSC RS-170A or a PAL 625/50 analog composite video reference signal (bi-level) or to a tri-level reference signal for the HD frame rates. Time code reader mode displays time code, user bits, and frame rate values when reading time code, or GPS time and date values when reading GPS data. All settings and presets are maintained in non-volatile memory, even when the battery is removed. Includes XLR-RCA, RCA-3.5mm phone, and RCA-BNC adapters, plus 18" RCA-RCA cable. Operates in display power save mode for over 17 hours on a single 9V alkaline battery. Light weight and palm sized.